Alpine transport, above and beyond the crucial issue of freight, concerns people and regional development. 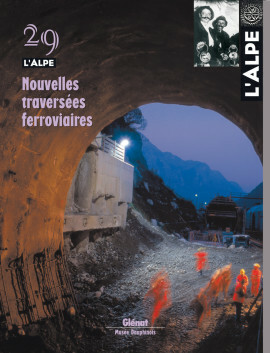 The four projects for low-altitude tunnels therefore represent four chances to rethink territorial planning and the future of the Alps. The major train routes, current and future, throughout the Alpine crescent. A map prepared by Thomas Lemot specially for L’Alpe . The Alps have always been a route and crossroads. The flow of people generated trade and change, though variable over time because so highly dependent on the history of Europe. In 1480, the Viso « opening » was carved out at an altitude of 2 850 metres. A magnificent undertaking in pursuit of an astute trade and military strategy. And a visionary work to provide a link between France and Italy. Rail conquest of Alpine regions is a centuries-long saga that continues to this day with the low-altitude tunnels. Technical progress and economic and political interests combined over time to develop a multi-facetted network, ranging from the major international lines through the Alps to small cog-wheel lines that even today delight tourists. The final drilling of the Lötschberg tunnel in April signalled the near completion of a gigantic task. If all goes well, trains carrying trucks will speed along under the Alps between Bern and the Valais region by the end of 2007. An update amid the water, mud and tremendous noise with the people who are truly moving mountains. At the Lötschberg, Swiss photographer Bernard Dubuis captured the daily life of the men and their work on the enormous worksite. In spite of the very technical subject and the awesome size of the project, he opted for a very humanist approach highlighting the roles of the workers. Drilling through a mountain is no small task. Great biceps and steel pickaxes have given way to ever more sophisticated tools. And to constantly refined techniques required to handle the difficulties of the terrain and the sheer size of the new tunnels. Bled white by intestinal worms, hundreds of miners died during the construction of the second train tunnel under the Alps. The terrible conditions combining heat, humidity and promiscuity explain the proliferation of the tropical parasites. Four new, low-altitude, train tunnels will make travel through the Alps easier by 2015-2020. The four high-speed lines will cut distances and bring together the cultures of Europe, as well as reduce the impact of road traffic. The Lötschberg and the Gothard are well under way in Switzerland, but the Lyons-Turin under the Mont-Cenis and the Munich-Verona under the Brenner have yet to begin. An update. This aspect lies at the heart of the studies on the major train links through the Alps. More than a question of economics, politics or even ecology, it is in fact a societal issue, as the Lyons-Turin project makes clear. Better coordination of political action starting right now is the absolute condition to make sure the new train tunnels are not underused in fifteen years. Ideas from an expert on Alpine transport. In 2020, trains will carry half the traffic through the Alps if the financial decisions by European leaders for the period 2007-2013 support the project. A review of the situation by Jacques Barrot, Vice-president of the European commission in charge of transportation.